It doesn't look like much - just a white card with a set of four capital Es on it, one with the arms facing up, one down, one left and one right. But simple as it may appear, this card is actually an important tool for those working in an innovative program based at Misericordia Health Centre. As the name suggests, the Focus on Falls Prevention Vision Screening Program is responsible for screening the eyesight of residents in care homes and seniors in the community, with a view to supporting patient safety and reducing injuries from falls that can result in loss of mobility and indepedence. First launched as a pilot project in 2006 and then established as a regular province-wide program in 2010, the initiative is based on a very simple premise, says Mary Ann Masesar, program co-ordinator and education facilitator at Misericordia. 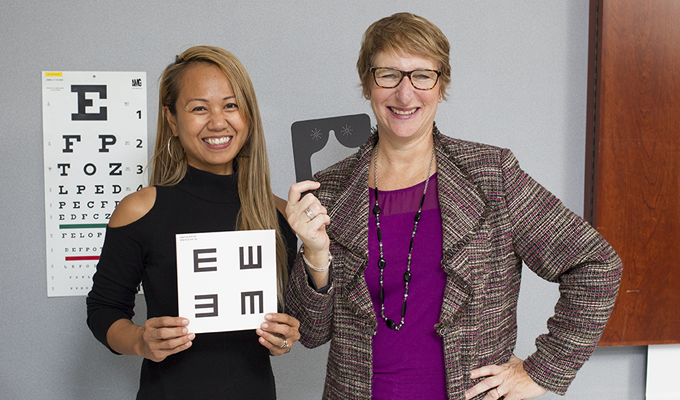 Karen McCormac (right) and Mary Ann Masesar with vision screening tools. "The assessment identifies vision impairment," she explains. "Can the resident safely accomplish activities of daily living?" 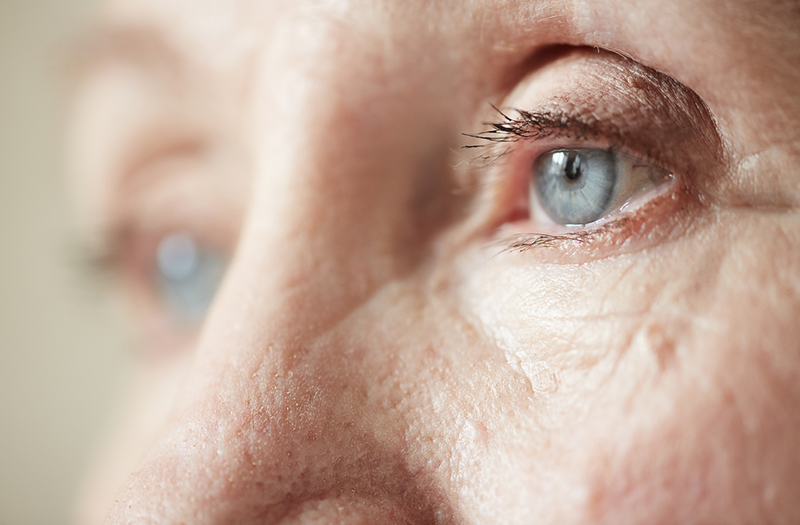 An estimated 20 to 50 per cent of older adults have undiagnosed vision problems, and many personal care home residents have trouble seeing well enough to avoid tripping and falling. Even seemingly simple things, such as a transition from tile to carpet, can represent a tripping hazard for people who can't clearly see their surroundings. Steps can be hazardous and handrails ineffective for those who can't see where to place their feet or hands. Karen McCormac, Executive Lead for the Focus on Falls Prevention Vision Screening Program, says falls are a common occurrence at personal care homes and hospitals. And since a fall can result in an injury that will end a resident's independence and quality of life, preventing falls is a priority. It's also worth noting that falls prevention also benefits the health-care system. Preventing a single hip fracture can save $60,000 or more. "Fall-prevention strategies emphasize interventions focused on strength, flexibility and balance, but we also want to make sure that we're looking at vision," says Masesar. Sandy Bell, a former nurse manager in one of Misericordia's long-term care units, came up with the idea for the screening initiative in 2005. At the time, children of residents would ask if their parents' vision could be checked. Bell looked for a screening tool that could be used to identify vision impairment in residents and came across a one being used in the Centre for Eye Research in Australia. In 2006, Misericordia conducted a research study at Misericordia Place personal care home to test the tool's effectiveness. The study tested 74 residents who did not have a vision diagnosis at admission. However, when screened, 72 did indeed have a visual deficit. The connection between treating vision deficits and reducing falls was demonstrated by comparing falls among those who had their vision deficit treated and those who elected not to. Of those who received treatment for a vision problem, none experienced falls or fractures. Of the 29 residents who declined treatment, 18 had falls, resulting in eight fractures. Those with untreated vision deficits also had lower levels of social involvement and higher levels of depression. In 2009, a study examined seven personal care homes where the screening tool had been used and found similar results. The test was effective in identifying residents with vision impairment, and those residents who accepted treatment had fewer falls than those who didn't. In one personal care home, treating the vision deficit led to a 76 per cent decrease in falls with injury. The screening itself only takes about 10 minutes and is intended to identify residents who need to be seen by either an optometrist or an ophthalmologist. As part of the screening, residents are asked to identify which direction a capital E on the test card is facing. During the screening, the test card is held at reading distance and then a distance of 10 feet. This part of the screening helps indicate whether the individual should be referred to an eye care specialist. In another part of the screening, the individual looks through a black eye mask with a series of small pinholes in place of eye holes. A typical near-sighted person looking through the pinholes will find that they make vision slightly clearer - just as squinting can make your vision slightly clearer. If looking through the pinholes doesn't make things any clearer, that's a sign that the resident should be referred to an ophthalmologist. Ophthalmologists focus on diseases of the eye, including glaucoma, macular degeneration and cataracts. Optometrists are focused on vision acuity, as well as assessing general eye health. 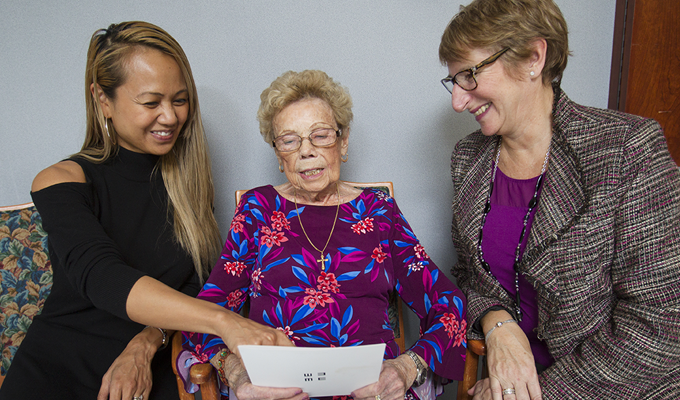 Misericordia Place resident Bruna Dandri looks over an eye test card with vision screening team members Mary Ann Masesar and Karen McCormac. The screening tool will often reveal that people can be good at hiding their vision challenges. "It's surprising when you see them in their space because you think they're seeing fairly well but then you do the screening and you see that they're seeing 20/100 or 20/200 and they're really just seeing shapes," says McCormac. Sometimes, it turns out that a resident with very impaired vision has been navigating by feel or memory, without seeing clearly where they're going. McCormac recalls a visit to a personal care home where a woman walked into the dining room, appearing as if she could clearly see where she was going, and then placed her eyes right up to the menu to be able to read it. "It's eye-opening for the staff to see that a lot of their residents don't see well at all," says Masesar. While the impetus of the vision-assessment tool was to reduce the risk of falls, finding undiagnosed vision problems also improves a resident's quality of life. Before the assessment, the common intake practice at personal care homes was to check whether a new resident wears glasses, but there was no assessment to determine if they could see well. Since the development of the screening tool, Masesar and McCormac have trained more than 100 staff to assess vision and screen for impairment. They have been to about half of Winnipeg's 38 personal care homes and have also carried out training in Brandon, Dauphin, Beausejour and Selkirk. Health institutions in other provinces have also contracted with the Winnipeg Regional Health Authority for McCormac or Masesar to conduct training for staff in Nova Scotia, British Columbia and the Northwest Territories. Another service overseen by the vision-screening program is a mobile Optometry Clinic, in which an optometrist visits personal care homes where the vision assessment has indicated that residents require a full eye examination. Having the optometrist visit the personal care home instead of having the residents travel to the optometrist makes it easier for everybody to ensure that vision is properly diagnosed and eyeglass prescriptions are updated. On these visits, minor repairs such as replacing nose pads or tightening frames can help to make sure glasses fit right. 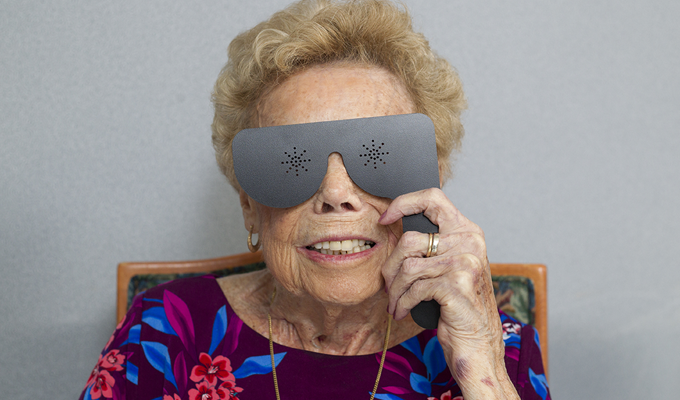 Misericordia Place resident Bruna Dandri peers through a pinhole mask, which is used to test vision. The Focus on Falls Prevention Vision Screening Program also participates in a variety of community-based programs such as falls clinics within the region, education for community seniors and families, organizations and conferences. Nurse Angela Raine-Magri has been carrying out the vision test at the Action Marguerite personal care home in St. Boniface for two years. The assessment is offered to all new residents within one month of admission. Most residents who are assessed are then referred to an optometrist, often to update an eyeglass prescription and to assess overall eye health. "Residents' vision is something that often gets overlooked," she notes. "The staff knows if a resident has glasses and will remind them to put them on or will clean them if they need it. But they don't necessarily know how well the resident can see with their glasses on. Some people come in and they've had the same pair of glasses for 20 years." Raine-Magri says that caring for the vision of residents is good for their quality of life because it removes a potential obstacle to participation in social and recreational activities and allows greater independence.